After working in an office set-up for almost seven years, Mitali Phalsar (name changed) had to retrack her career so she could relocate with her husband. But her company trusted her enough to try out a work-from-home opportunity. Sadly, not enough woman chance upon such pronounced companies. There are many who sacrifice their career because of marriage, motherhood or mobility; in the hope that they would one day rejoin the workforce. In a study by the Center for Talent Innovation (CTI) it was revealed that in India, 36 percent women take a break from work for personal reasons and only 58 percent of them are able to rejoin full time work. Dr Saundarya Rajesh, founder-president of AVTAR Career Creators, in his interview agreed and explained, "Five years back there were around 1.2 million women on break who wanted to get back to the workforce. The statistics have risen to 1.8 million currently." And while there are women looking for a comeback, there are companies that are willing to absorb a female talent after a long sabbatical. So if you are one of them, then you must watch out for these companies and apply for their back-to-work programmes. 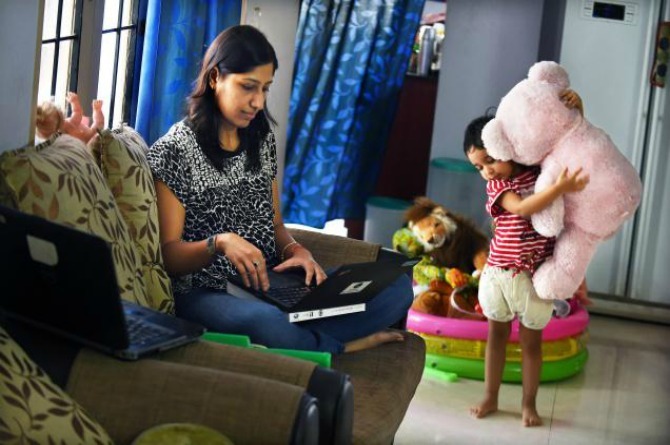 Last year, Intel India launched a one-of-its-kind 'Home to Office' initiative with the aim to help bring women back to work from their career breaks due to family or personal needs. This programme is basically a stage of internship for women who want to get back to their corporate careers at Philips. This programme provides an opportunity to women to work on projects across all three sectors -Lighting, Healthcare and Consumer Lifestyle in functions including HR, Marketing and Strategy, Finance, Supply Chain and R&D. If you are an applicant then you must have at least 3 to 6 years of relevant experience in these specific domains. This programme was launched in March 2008. It is a career transition management programme for women professionals who have taken a break of 6 months or more for any reason, and wish to re-enter the professional space. The programme provides opportunities for such women to take on flexi-hour assignments with various TATA group companies. The age limit for this programme is 50 years and the company recruits throughout the year. Continue reading to know about more back to work career opportunities in leading Indian companies. This programme available at GE’s John F Welch Technology Centre, Bangalore, focuses exclusively on hiring women scientists and engineers who have taken a career break and wish to get back to work. There is also a facility of flexible timings and work-from-home opportunities to make it easy for women working with the company. With this programme, HUL wants to make it easy for women on a career break to step back into the working world. This comprehensive programme balances a woman’s personal and professional needs. Career by Choice allows women to structure their work around their lives. You can choose from a variety of verticals including functions like Sales & Marketing, Human Resources, Supply Chain and Research and Development. This programme began in January 2014 and offers a six-month internship to women who have been out of the work force for a year or more. This primarily focuses on a career in the digital advertising space. This programme that started in 2011, is meant to attract back women who have taken a mid-career sabbatical. “Any woman professional with the requisite skill-set can apply, and anyone with, at maximum, three years of personal sabbatical qualifies for the programme,” says their site. You can apply into the porgarmme if you are skilled at SAP, Peoplesoft, BAO, DBMS, MF AS 400, Open Systems, AIS, WDC and Open Systems (Unix , C, C++, shell Scripting, Perl Scripting). As a new IBMer, you will be inducted with an ‘Assess & Assimilate’ programme that will focus on up-skilling and an IBM orientation. The business software solutions company ensures that women employees return to work after a sabbatical or maternity leave through this programme. In this initiative, women who themselves have experienced career breaks are chosen to play the role of a buddy. They then stay in touch with the absent employees, update them on new developments at the workplace and address their concerns. Started in 2014, the ‘Re-connect’ programme offers jobs to former women employees who have left the system in the past 10 years, in select states. This opportunity is specifically open to its own former bank female employees who have left the system. Those women who otherwise had restrictions in the terms of number of positions and locations can also apply for this. This programme was launched in 2014 and is not specifically a return-to-work programme. In fact, it was started to reach 1 million more Indian women to take up IT as a career field, learn new skills and stay put in this domain. Therefore, if you are applying to return to work, this could be a good opportunity. Microsoft is a great brand for women who have experience in the IT field and are interested to go back to the corporate world. In this programme, women who are currently not employed can apply to jobs that are relevant to their work experience. You will be required to have a minimum experience of 3 years. The good part about this programme is that if you are selected then you will be given a full-time job at the company. This particular programme, is made to rope in qualified women who are on a break and who want to rejoin work. It offers flexible and family-friendly schedules and work structures for women, under various mid-level and senior-level positions. Must-watch: 5 Indian mums discuss the lies they have told their kids and why! Is your parenting style like that of a hippo?